Hello everyone! Today I'm going to be blogging about a TV show I started watching recently and am really loving. Its the series 'Outlander' and I've been watching it on Amazon Instant Video although I imagine you can find some links for it online somewhere. I'd actually first heard of the Outlander show because my gran reads the books that the series is based off of and she wanted to watch it. The book series is 8 books long and was written by Diana Gabaldon, I hope to be starting them soon! In Outlander Claire, an English nurse, is transported back in time from 1945 to 18th century Scotland. Here she is attacked by her husband's ancestor, who is a member of the English army, stationed in Scotland. She is saved by a 'rough Scottish warrior' and is taken by the Scots to the castle where they live. The head of the clan is unsure as to whether or not she is a spy or not but can see that she is a great 'healer' and forces her to stay in the castle and work for them. Being Scottish, I really enjoy all of the Scottish music etc in the series. There's also quite a lot of Gaelic in the show. I speak a small bit of Gaelic and it so its quite fun to listen in and see if I can pick up words that I know. They don't subtitle it which is kind of annoying but it also puts you in Claire's shoes because she cannot understand it either! The Scottish history in this show is what I enjoy the most about it, I don't normally go for period dramas. Even if you aren't Scottish, I still think you might find this interesting! The show obviously contains a lot of romance. It puts Claire in this awkward situation where she still loves her husband from 1945 but was attacked and almost raped by his ancestor. The show cleverly uses the same actor for both characters, making us despise her husband even though he has done nothing wrong. 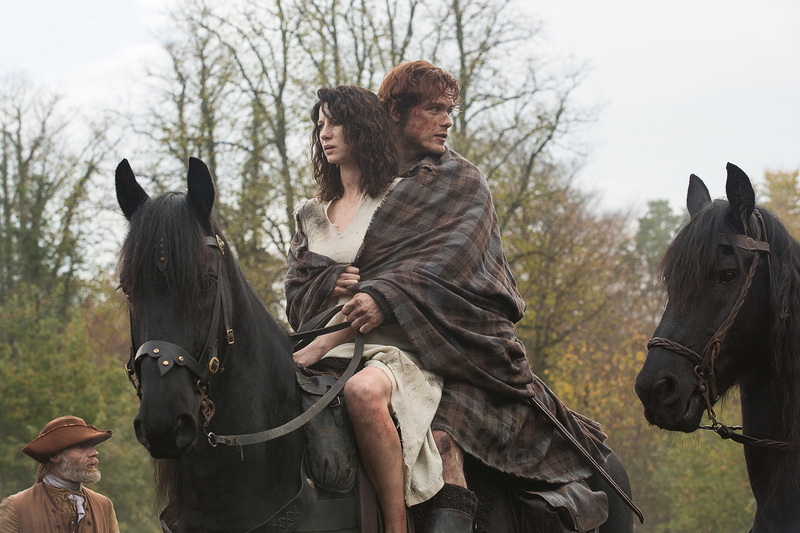 This makes you root for a romance between Claire and the Scot who saved her. Its kind of a love triangle but it has quite a twist to it and I really enjoyed the show! The first 8 episodes of the 16 episode long series are out just now! I can't wait to watch more of it and find out what happens. I'm also going to start reading the books and see if I enjoy them as much as I enjoy the TV show!